When he was archbishop of Buenos Aires, almost all the priests he proposed to be appointed bishop were rejected. According to sources, almost every list of candidates that Bergoglio would propose (three names, per the Holy See’s standard practice) for an open see for bishop would be overlooked. Instead, the appointments came from the lists proposed by Adriano Bernardini, now Holy See nuncio to Italy and from 2003 to 2011 Nuncio to Argentina. His choices were reportedly influenced by Angelo Sodano, then Vatican Secretary of State, and Leonardo Sandri, an Argentinian and Sodano’s deputy. Their influence continued even after Sodano became Secretary of State Emeritus and Sandri Prefect of the Congregation for the Oriental Churches. This is how – Argentinian sources maintain –dioceses in Argentina came to beled by careerist bishops with weakmoral character. This anecdotal characterizationof events is undoubtedly an oversimplification of reality, as the appointment of bishops can hardly be reduced to such black-and-white determinants. 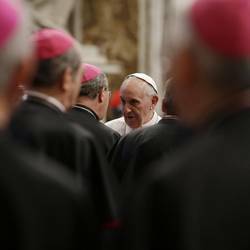 On the other hand, it would be certainly possible that Pope Francis had that situation in mind when, on June 21, he addressed the 150 papal nuncios who represent the Holy See around the world. The Pope’s meeting with his nuncios had been scheduled as part of the Year of the Faith. It was to be a sort of spiritual-retreat journey, enriched by a meeting with the pope. Benedict XVI’s renunciation somewhat changed the scope of the event, since it offered the newly elected Pope Francis the first opportunityto meet with his «ambassadors». Two passages in his remarks in particular alluded to Bergolio’s hardships in Argentina. Many might see in this language a public denunciation of the administration of Cardinal Tarcisio Bertone, who still remains as Secretary of State. Bertone was criticized for filtering access to Benedict XVI excessively. The same kind of criticism was levied against Benedict XVI’s private secretary Georg Gaenswein. Nevertheless, Vatican sources insist that Bertone – now very close to retirement, to take effect probably in October – enjoys Pope Francis’ trust, and that the latter even asked him for recommendations regarding eventual promotions. Yes, Bertone might be considered a muddler, but he is certainly loyal. More likely, Pope Francis’ words referred to his prior experiences with Cardinal Sodano. A papal nuncio to Chile for many years, Sodano acquired an incomparable influence in all of South America. Sodano’s men have been appointed to the ranks of many nunciatures and of the CELAM (the Latin American Bishops’ Conference). Sodano also gained influence thanks to the Legionaries of Christ. Under Sodano’s tenure as Secretary of State, the wrongdoings of the Legionaries’ founder,Marcial Maciel, were never brought to light. For years, Sodano was such an active filter for the papal apartment that many news did even reach the first of the four loggias of the Apostolic Palace. It was the then prefect of the Congregation for the Doctrine of the Faith, Joseph Ratzinger, who fought for transparency. Ratzinger carried this commitment with him when he was elected Pope. Not by coincidence, his pontificate has been one of the most difficult and attacked of the last 70 years. A special call, in a speech in which Pope Francis did not offer guidelines for diplomatic action. This is the third aspectof the speech that stands out. For the time being, Pope Francis has left the Holy See diplomatic machine in motion, with the same guidelines introduced under Benedict XVI. The latter changed its diplomatic perspective, and anchored all Holy See diplomatic activity on truth (a theme ever more present in the Holy See’s international relations documents) as it emanates from the Gospel and natural law. Pope Francis seems to share this perspective, so much so that he did not even presented his own guidelines for diplomacy in his first speech to the Corps of Ambassadors accredited to the Holy See. Pope Francis prefers instead to focus on the spiritual aspect of being a nuncio. This is why he delivered tothe nuncios a speech «written by myself» in which he focused on their responsibility to be shepherds, nomad priests, rather than on theirduties as diplomats. For now, Pope Francis is still in the walking mode. He wants to bring the Church to the world, and he wants every believer to come out and reach «existential peripheries». History will tell if he will be the one who will carry forward confessing, which is the purification required before building. How much more sowing will still be needed to have once again a Church that is alive?